A brief guideline to keeping your homepage clean and user-friendly! Your homepage should be given the same thought and care you give the front entrance to your farm/ranch. This is not the place to start a junk pile of rundown farm equipment that you're keeping around for spare parts. Nope, this area of the farm receives a "best foot forward" mentality, and rightfully so. Now the homepage is the front entrance to your website. It's the first impression, the roadmap, and the sales pitch all rolled into one, so some thoughtful strategy for how it's designed can go a long way. A main challenge for consumers is being exposed to too much information and options all at once. While your site should always be very informative, online shoppers will quickly become overwhelmed if you’re not careful. Which means it will pay off to be selective with the amount of content you hit visitors with on a single page. This is especially true for your main menu. Remember this is the roadmap for your entire site, and nobody wants to read a confusing map. So, avoid cramming too many options into this space. In fact, limiting the menu to just 5 links is a good practice to follow. This doesn't mean you should remove links to other helpful info about your farm/service. Instead, embrace the organizational power of submenus to keep the main menu easy to look at, as well as easy to navigate. These should be thought of as your 15 second “elevator" speech. Example: let's say you're at a conference, and someone steps in the elevator with you, notices your nametag, and asks, "What do you guys do?" Hurry--how do you answer? You've got just 15 seconds before the doors open so you'd better think quick. Now in the online space, people are much less patient, so your elevator speech should be condensed into something that can be understood in just five seconds. This can best be achieved by being intentional with your header photo and message. The photo should quickly make visitors aware that your business is a farm, while the message should describe your product and service in a short sentence. 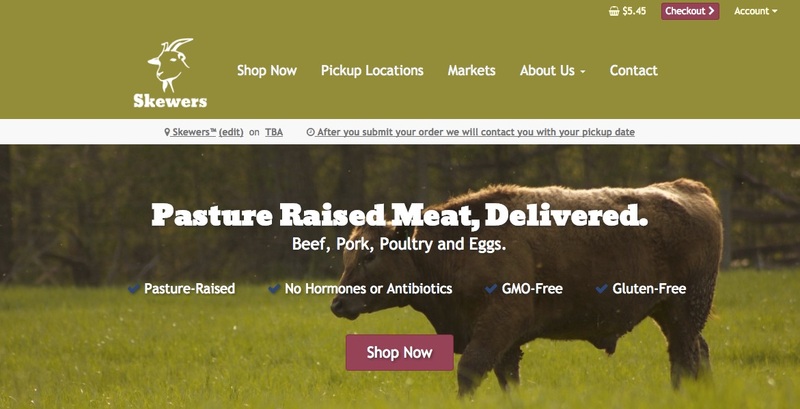 Example: a photo of cattle grazing green pasture behind the message, “Grass-fed Beef, Delivered to your Neighborhood” paints a clear picture; in just five seconds. Another thing that can confuse visitors are too many CTAs buttons (call-to-action). The end goal of your website should be to convert visitors to customers, so it’s important to make this process as simple as possible. For example, including a field for customers to subscribe to your newsletter right next to your “Sign-Up” CTA, only adds to the clutter and likelihood that someone will be confused as to what they’re actually enlisting for. Also, it's best to use a high contrasting color to increase this button's visibility, i.e., if your color theme is forest green, don't make your CTA another shade of green. The simplest thing is to leave this button red, as this is widely debated as the most effective color for conversions. As the very successful marketer Simon Sinek frequently says, "People don't buy what you do, they buy why you do it." With the popularity growth organic/natural foods have seen in recent years, it is now easier than before to convince consumers to buy into your vision. 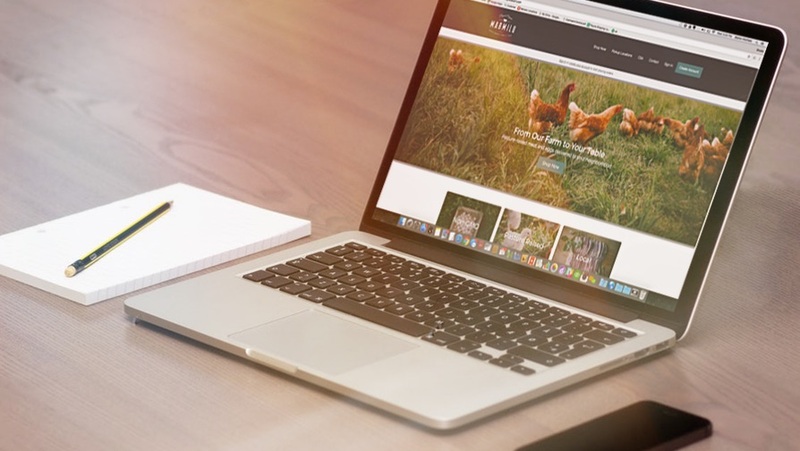 So, whether it be a mission statement, video promo, or simply your farm's story, take a small portion of your homepage to explain the motivation behind why you farm the way you farm. Answering this questions creates connection with consumers and adds authenticity behind your brand. However, remember to keep it clean and not to let this section take up too much real estate. An imbedded video, or short paragraph with a link directing to the full story will suffice. This is where you make them hungry. Showcase all the different types of products you have to offer by using the photo grid content block within GrazeCart. This will display your product categories in a symmetric format that link to the associated collections on your store, which is where you want lead your visitors. Attractive product photography is crucial here, so if you don't have high quality images, purchasing stock is well worth the investment. What is your farm-to-table process? Don’t over complicate it. This is not where you should list your ordering policies or FAQs. GrazeCart is equipped with an easy to customize, three step “How It Works” content block. If your process can’t be summarized in three sequential steps, then your system may be too complicated and you should focus on simplifying. Design and usability can feel like major time consumers, but your website is the heart of your direct marketing enterprise, so effort invested here is rarely wasted. In the end we're not just trying to make it look great, but focusing on the customer experience as well. In the words of Steve Jobs, "Design is not just what it looks like and feels like. Design is how it works." User friendly functionality and an easy to understand design are no longer perks, but expectations by many online shoppers.